Key Difference: ‘Off break’ is an off spin delivery for a right-handed bowler and a right-handed batsman, which will turn from the off side to the leg side. 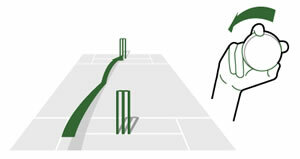 ‘Off-spin’ is a form of bowling in which the bowler imparts spin on the ball with the fingers as the ball is delivered. There are many different cricket terminologies that are known by the die-hard cricket fans. For the rest of us, these words can become pretty confusing. These terms describe various different strategies used for batting and bowling. Off-break and off-spin are two bowling styles that are used to deliver the ball in cricket. The terms refer to the trajectory of the ball during delivery by bowlers. The bowler that specializes in this kind of delivery is referred to as spin bowler of an off-spinner. Although, these two terms may seem similar because of the trajectory of the ball, these two terms are considered different. In both delivery methods, the ball spins from the right-handed batsman’s right side to left-side. An off-break is bowled by holding the cricket ball in the palm of the hand with the seams running across the fingers. When the ball is released, the fingers roll down the right side of the ball, and a clock-side spin is given to the ball. The ball spins towards the leg side when the ball pitches, or when it hits the ground. An off-spin is bowled by resting the index and the middle fingers well spread across the seams. The ball just rests against the third finger. When the ball is released, the index finger and the rotation of the wrist is used to deliver the spin in the ball. The ball is turned in the clockwise direction upon spin, which moves the ball from the off-side to the leg side during a pitch. An off-break is considered as a type of off-spin that is done under a special circumstance. This circumstance includes a right-handed bowler bowling to a right-handed batsman. An off spin bowler will bowl mostly off breaks, varying them by adjusting the line and length of the deliveries. Many state that there is no significant difference between the two terms; however, others claim that there is a huge difference. According to questioncricket.com, the difference lies in the way the ball is delivered. Off break bowlers only spin on favored pitches, rather than every pitch. Off-breakers use fingers more than wrist for spinning the ball. Off-spin bowlers also rely on the wrist rotation to spin the ball during pitch.